Looking to See Increased Closings? Learn to Skyrocket Your Future Through Success Principles That Work! Been There, Done That: Ten Agent Success Principles from a Short Sale Insider is a humorous, short-sale inspired guidebook on how to be a great real estate agent. 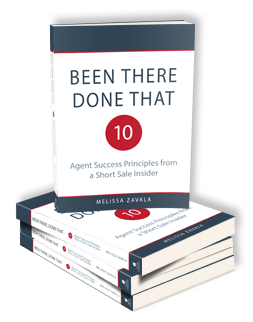 Leveraging the many hard-earned lessons from her experience of closing thousands of short sales, real estate broker Melissa Zavala reveals the ten success principles that put her – and could put you – on top. The values section is peppered with solid business principles to inspire and engage you in a fresh, modern approach to your career. Practical how-to tips to generate more leads and close more deals are woven into entertaining, real-life anecdotes throughout. You’ll meet Aunt Mabel, learn about the Fosbury flop, and take a roller coaster ride through the wacky world of short sales. Almost too crazy to be true stories about near miss foreclosures, Lady Gaga, and what a chocolate bacon cupcake has to do with your real estate career abound. This book is NOT a short sale how-to primer, although there are short sale examples and stories within it. The short sale information is used as a springboard, a real life master case study, to emphasize the larger point—to be successful in your career you have to lead with your values, have a great plan, and follow through. You’ll learn the value of dedication, the power of persistence, and the need for amazing organizational skills. You’ll discover how your empathy, your professional competence, and even your online social media presence dictate your success. Although you may dismiss some of these skills as “soft,” they are all an essential part of your real estate success toolbox. With Melissa’s how-to and career planning advice, you will experience, firsthand, what it takes to make it as an in-demand agent in the real estate market. Her roadmap, designed to bring humorous insight, cuts to the point while making the connection between being great in real estate and being great in life. Online access to exclusive companion resources and additional real estate tips and tools are included.